Safford and Sabino both came into Friday night’s 3A South Championship game with lengthy winning streaks. Safford had won 6 straight, Sabino 7. One of those had to end. Sabino made quick work of the opening possession of the game, going 75 yards in 8 plays and capping a 4th and goal with a 2 yard touchdown run by Jamel Brown. That would be the only score of the 1st quarter. Sabino led 7-0. Safford would answer back with 10:48 left in the first half with quarterback Mason Duros hit Jerrick Arbizo on a play action pass from 21 yards out to tie the game at 7. Exactly one minute later Safford’s Justin Torrio jumped a slant route and deflected a pass, it ended up in the arms of Sam Tobias who returned it 40 yards untouched for the second straight Bulldog score and the 14-7 lead. Sabino wasn’t done however. They called on Brown again from 3 yards out with 5:49 remaining in the half to cut the lead to one. Kicker Johnny Atnip pushed the PAT wide right and Safford still held the 14-13 lead. Safford’s next drive started at their own 6 yard line with 5:40 remaining in the first half. They proceeded to run right, left and up the middle en route to a 90+ yard drive. With 4 seconds left, Torrio kicked a 22 yard field goal to give Safford a 17-13 halftime lead. The second half was much more of a championship game slugfest. Both teams moved the ball between the 30’s but could not get in the endzone. Sabino punched in the 3rd Brown touchdown with 1:21 left in the 3rd quarter to re-take the lead 20-17. The teams traded possessions for most of the 4th quarter before Safford put a drive together with 4 minutes left in game. 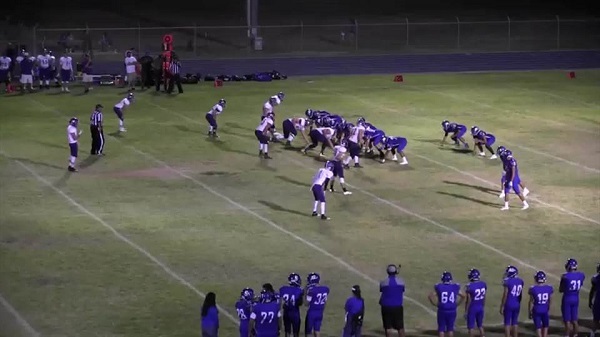 Facing a 3rd down and 11 at the Sabino 35 yard line, Safford tossed the football to Sophomore RB CJ Scrivner who powered through two Sabino arm tackles to pick up the first down. Then as the teams were headed back to the huddle, a flag showed up on the field. The call would be holding against the Bulldogs and make it 3rd down and 25. Safford would pick up 24 yards on their next play to set up a game deciding 4th and 1. Safford QB Jerrick Arbizo rolled to the right but couldn’t find any running room and was stopped for no gain and the Safford threat was ended. Sabino would run out the clock with an unorthodox fashion. Instead of just taking knees, the Sabercats ran their quarterback Jimmy Hamilton back and forth sideline to sideline before taking a knee and running out the clock. Safford held Sabino to under 300 yards of offense while posting 352 total yards themselves, 279 on the ground. Safford’s rushing attack was led by Arbizo who tallied 155 yards on 24 carries. Scrivner had 94 yards on 18 carries. Torrio led the Dogs in receiving with 3 catches for 33 yards. The Bulldogs end the regular season with a 6-4 record. They will now get ready for the second season, the State Playoffs, that start November 2nd. They will find out their opponent on Saturday when the brackets are released.